« RBTS | Teaching Social Justice in the Writing Composition Classroom: Rising Up! 12:00 p.m. to 1:00 p.m. 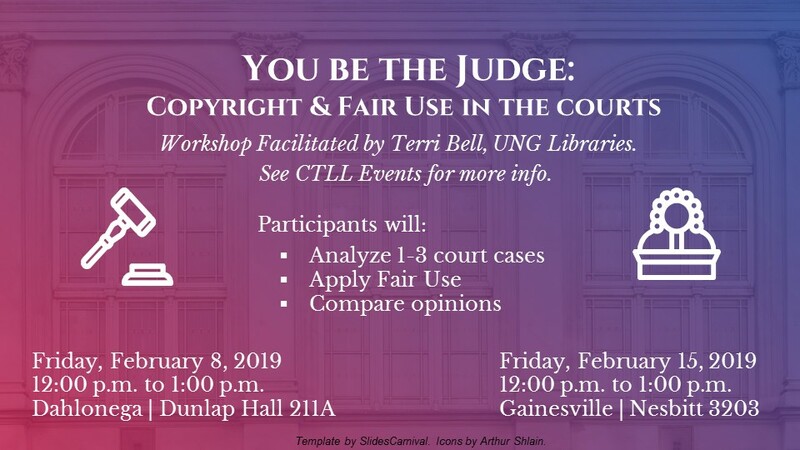 In this workshop, we will explore Fair Use through the lens of three copyright infringement cases in order to understand how the four factors of fair use work together. This will be a discussion-based presentation where you get to play the judge. First, we will perform an analysis of the respective issues of each case. 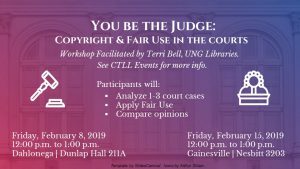 Then we weigh the case against the four fair use factors and finally, we will compare our humble (or not so humble) opinions with how the courts actually ruled in each case. Two of the three cases represent the category of Education/Scholarship/Research, and the third case is in the Film/Audiovisual category. This workshop will be held on the following dates. Today’s workshop is in red. Friday, February 8, 2019 | Dahlonega Campus | Dunlap Hall 211A | 12:00-1:00 p.m.
Friday, February 15, 2019 | Gainesville Campus | Nesbitt 3203 | 12:00-1:00 p.m.
Terri.Bell@ung.edu in advance of the workshop.